Our group of 16 stayed in Villa Kalyana for a full week in August. Traveling to Koh Samui we had one concern- that the villa looks better in the pictures than it really is. But, it's the other way around- the place is genuinely amazing, very-well maintained and operated. The combination of large rooms/bungalows, the pool, green surrounding and private adjacent beach is world-class. Add to that the effective staff, headed by Renaud and Mam, and supported by an excellent chef and kitchen staff, and you have no reason to leave the property for the duration of your vacation. 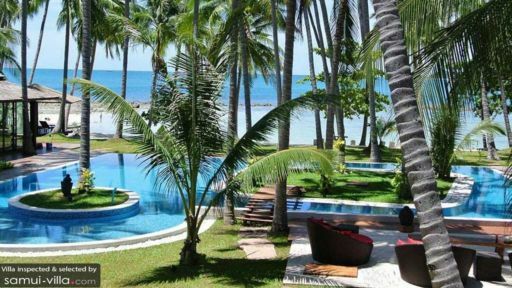 Bottom line- we do not think Koh Samui can offer a better large villa, whether for a wedding or for a relaxed vacation. We booked Villa Kalyana for our July wedding and stayed 4 nights with our bridal party and families. It is a beautiful spot, so private and lush. It lends itself to being a wedding venue so well and looked amazing on our big day, even the plan B rain option inside (which we partially had to use) was fabulous. Right from the start communication from the owner Peter and manager Renaud was efficient and they answered all my questions. Renaud even ordered in special allergy friendly sausages for my son. Mam and her staff took such good care of us all and the food was AMAZING! Best Pad Thai we had and lovely fresh seafood. It is a lovely villa and we spent most of our time poolside which included a toddler pool the littlies loved. The only minor complaint we had was that more pool towels needed to be put out or alternatively left in each room. The rooms are lovely, especially the bungalows which are huge. It was such a relaxing spot to be, and nice to be able to stay in one spot for a few days without having to leave at all. We are already looking to return in the next couple of years! Thanks Peter, Renaud, Mam and Sonn for your hospitality. Our friend had their wedding here and we stayed in one of the rooms...what a perfect venue in every sense. The staff could not have been more friendly and helpful, pool areas amazing, beachside location perfect, food delicious, rooms were spotlessly cleaned, I could go on and on. Would be happy to recommend to anyone else. My only tip would be that as it is a little off the beaten track (which is great as you certainly feel like you are away from the hustle and bustle of other tourists), if you get a taxi at any point to the villa, you should take a map of the location. Once you turn off the main road it is not well signposted and easy to get a little lost, especially in the dark. Recently we had our destination wedding at Villa Kalyana, wow, what an amazing venue! Alexa, the wedding planner organised everything for us, down to every tiny detail, and took all the stress out of arranging a wedding. It was just perfect, the rooms are amazing, the setting and location are stunning and the team at Villa Kalyana were very accomodating and attentive. Our guests commented that it was the best wedding they had been to. Thank you to all the staff at Kalyana and especially Alexa, we have some very special memories from our wedding day and would love to come back one day! My husband and I had the absolute pleasure of holding our wedding at this stunning venue. The private beach, the beautiful pool and the stunning gardens truly made our wedding setting complete. We rented out the entire place and had our bridal party and close family and friends join us for the lead in and post wedding festivities. The rooms are extremely spacious and clean and all have a pool and beach view. 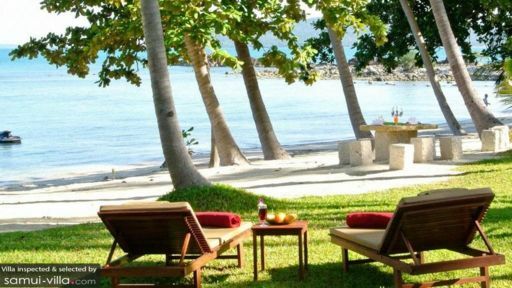 The Villa is extremely private and secluded and you honestly feel like it is your own little paradise. Is there life outside the Villa? Oh apparently! But we were more interested in relaxing by the gorgeous pool or swinging in the hammock or chilling out on the lounges. The staff were absolutely amazing. They truly looked after us and attended to all of our needs. Ma and, Sonya were extremely friendly and helpful and made our stay very enjoyable. We held a post wedding brunch and they ensured our drinks were icy cold and also laid out a beautiful brunch for our guests. Alexa Champion was responsible for the wedding planning and she was nothing short of AMAZING! Alexa’s bright and bubbly personality is what attracted us from the get go and upon meeting her for the first time on skype, my husband and I had no doubt she was the right person to plan our wedding day! She is nothing but patient, supportive, helpful, organized and truly lovely to deal with. No matter what your query, gripe, frantic freak out, nothing is too much trouble for Alexa and she has the amazing ability to be calm in any situation. Alexa coordinated our entire day from early in the morning till all hours of the wee morning! She was extremely calm, helpful, and bubbly and so well prepared and organized that I literally had nothing to worry about on the day! It truly was well organized and seamless. Her attention to detail is impeccable and not a thing I asked for was missed. If there were any issues on the day, my husband and I were certainly oblivious. When I stepped out onto the lawn to approach my husband on the beach, I was absolutely blown away by Alexa’s creativity. She had literally taken our vision out of heads and laid it before us! We felt truly blessed to have Alexa in charge of our planning. She was amazing on every level and we couldn’t have asked for a more perfect day. We used the Villa's Chef for our wedding meal and he did a wonderful job of preparing a Thai Family Style meal that all of our guests could share at their tables. Our guests commented on what a beautiful meal it was and loved the shared style idea. We had a truly wonderful time at Villa Kalyana and having not had the opportunity to see it before the wedding, were overwhelmed by what an amazing setting it was...truly perfect! We have emailed the owner about some minor maintenance issues at the villa that they need to get on to but given how great everything else is this was a minor thing. Highly recommended for either a wedding or just a wonderful holiday..
End of April we organized our yearly company outing at Villa Kalyana with approx 25 people. We enjoyed three great days in this paradise with calm white beach and great salt water pool landscape. All villas were spacious, clean and nicely decorated. We enjoyed lunch and dinner and all served food - either Thai food or their home made Pizza - was very tasty and well done. 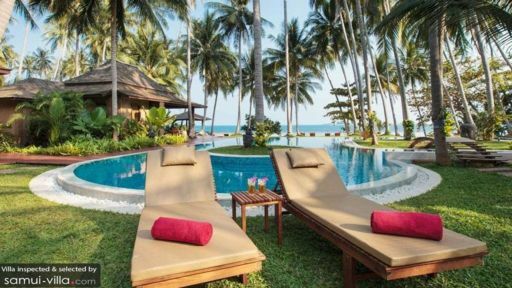 Villa Kalyana is well equipped with billiard and entertainment electronics so you can have a great time at this secluded place. It's 30 minutes away from the northern nightlife hot spots so it rather feels like you stay on your own island. A perfect location for company gatherings or weddings.